Iyama Yuta 9P won his first Honinbo title on July 19. Iyama bested the defending title holder Yamashita Keigo 9P, 4-3 in the title match series. Go fans who’d been anticipating the game were not disappointed. The pair produced an exciting and highly unusual game that kept observers on the edge of their seats, providing serious competition for the Tour de France. A series of kos in the early middle game resulted in a division where white (Iyama) took over 70 points of solid territory and black took thickness across the remainder of the board. White went on to win by 7.5 points after some impressive shinogi (fending off black’s severe attacks). This year is also the 400th anniversary of the formation of the Honinbo house, making the tournament even more special than usual. David Ormerod; based on his original article Iyama Yuta becomes Honinbo at Go Game Guru. An Younggil 8P has commented game 5 and game 7 of the Honinbo title match. Photo: Yamashita Keigo 9P (left) and Iyama Yuta 9P prepare to play the final game. The 67th Honinbo title match between Iyama Yuta 9P and Yamashita Keigo 9P is currently being contested in Japan. The match started in May 2012 and on July 9-10 Yamashita faced a kadoban (game that could decide the match) in Game 6. With his back against the wall, Yamashita fought hard and won by resignation. This levels the score at three all and leaves the Honinbo final to be settled by a decisive seventh game on July 18-19. Yamashita Keigo took the Honinbo title from Hane Naoki 9P in 2010 and successfully defended a challenge from Hane in 2011. Iyama Yuta is one of the top professional go players in Japan and this would be his first Honinbo title. More news to follow next week. Jingning; based on her original article Iyama Yuta and Yamashita Keigo deadlocked in 67th Honinbo on Go Game Guru. Photo: Iyama Yuta 9P (left) and Yamashita Keigo 9P. Challenger Yamashita Keigo 9P (at right) won the Meijin title match last Friday, taking the title from defending Meijin Iyama Yuta 9P in six games. After Yamashita went up 3-1 in the seven-game match, Iyama was in a tight position. He successfully defended a kadoban (match-deciding game) in Game 5 to bring the score back to 3-2, but faced another one in Game 6. Iyama Yuta’s fans hoped that he’d be able to stage a fight-back and defend the title but their hope was short-lived after Yamashita neatly wrapped up the series with a 3.5 point win as white on October 28. The final score for the series was 4-2. Yamashita Keigo now holds the Japanese Honinbo and Meijin titles simultaneously. Just the seventh player to do so, he joins Sakata Eio, Rin Kaiho, Ishida Yoshio, Cho Chikun, Cho U and Takao Shinji in the history books. - Jingning; based on her original article: Yamashita Keigo wins 36th Meijin at Go Game Guru. Photo: Yamashita Keigo, Honinbo Meijin. Park Younghun 9P took the World Meijin title for Korea on Saturday (August 20), defeating China’s Jiang Weijie 5P and Japan’s Iyama Yuta 9P. The 2nd World Meijin tournament – officially called the China Changde Cup, World Mingren Championship – was a contest between the domestic Meijin title holders in China, Japan and Korea. In China and Korea the titles are called Mingren and Myeongin respectively. The format of the tournament was similar to the recent Bosai Cup. There were three rounds and two wins were required to take the title. In the first round, Park defeated Iyama, securing a place in the final. Jiang, who drew a bye in round 1, eliminated Iyama in round 2. Park won the final in 132 moves, after successfully fending off Jiang’s last ditch attempt to kill one of his groups. Congratulations Park Younghun! Correction: While we’re on topic of Park Younghun, in last week’s article: Park Junghwan Wins Fujitsu Cup, Breaks Record we incorrectly reported that Park Junghwan 9P had broken Lee Sedol 9P’s record as the youngest ever winner of the Fujitsu Cup. While it’s true that Park Junghwan now holds that record, one sharp-eyed E-Journal reader pointed out that it was in fact Park Younghun’s record that was broken. Park Younghun broke Lee’s record by almost two months when he won the Fujitsu Cup in 2004. The original article has been updated. - Jingning; based on her original article: Park Younghun wins 2nd World Meijin at Go Game Guru. Photo: Park Younghun 9P. 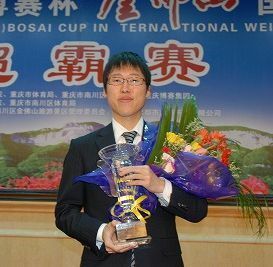 Iyama Yuta 9P has surprised many in the Go world, defeating first Lee Sedol 9P and then Gu Li 9P, to bring the Bosai Cup home for Japan. 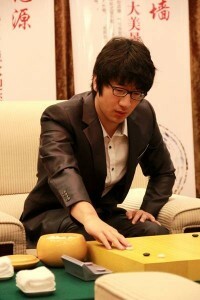 The 1st Bosai Cup was an invitational even held in Chongqing, China. The format is similar to the Super Meijin, with one player from each of China, Japan and Korea being invited. Three matches were played to determine the winner. In the first match, Iyama beat Lee in 205 moves, to take his place in the final. Gu then knocked Lee out of the competition and challenged Iyama. 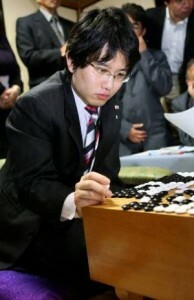 On May 18, Iyama continued his good form, winning the tournament in 208 moves. Is this the final step in Iyama Yuta’s rise to the top? Japanese go players and Iyama’s fans around the world certainly have something to celebrate today. Congratulations Iyama Yuta! For more details, visit: Iyama Yuta defeats Gu Li, Japan wins Bosai Cup at Go Game Guru. - David Ormerod; compiled from the reports on Go Game Guru. Photo: Iyama Yuta 9P on top of the world, receives the Bosai Cup. This year’s Chongqing International Golden Buddha Mountain Tourism and Cultural Festival (in China) features a three-way invitational tournament between the world’s top pros. The tournament is being called the Bosai Cup and Korea’s Lee Sedol 9P, China’s Gu Li 9P and Japan’s Iyama Yuta 9P are competing. These three are facing one another in a series of three exhibition games. Gu drew a bye in the first round, so Lee and Iyama played today (May 16 2011). Iyama beat Lee by resignation and took the first spot in the final. In a rematch of last month’s 3rd BC Card, Gu will play Lee for the second spot in the final. The match starts at 1:00pm, May 17, Beijing time (1:00am US Eastern Time) and will be replayed live on Cyberoro. The May 18 match will be replayed the following day, also starting at 1:00pm Beijing time. Can Iyama Yuta bring a win home for Japan? - Jingning; based on her report Lee Sedol, Iyama Yuta and Gu Li go head-to-head at Go Game Guru, which includes the game record. Photo: (from left) Lee Sedol, Gu Li and Iyama Yuta. Cho U 9P’s efforts to avoid losing another of his titles has become an uphill fight in the Tengen. On December 3rd Challenger Yamashita Keigo 9P won the third game of the best-of-five-games title match to take a 2-1 lead. Cho won this title last year for the first time. Yamashita has also held the title for one year, 2004. He lost it the next year to Kono Rin 9P and failed to retake it as challenger the next two years. Cho held five of the top seven Japanese titles at the beginning of this year, but lost the Meijin to Iyama Yuta 9P in November. The fourth game in the Tengen match is scheduled for December 10th.